the fire department by working in many positions and getting to know the community. Allan really enjoys helping people, he loves to see people succeed, so this career became a natural fit for him. What has been the most rewarding part of your job thus far? How would you describe your work environment and the people you work with? Allan’s daily routine varies greatly as he is getting accustomed to this new position. Allan is directly responsible for 13 employees and in charge of all seasonal staffing, along with other duties, including responding to emergency calls and being the on-call Chief Officer. His office is known for being a revolving door, constantly flowing with fellow coworkers and community members, so he stays very busy. 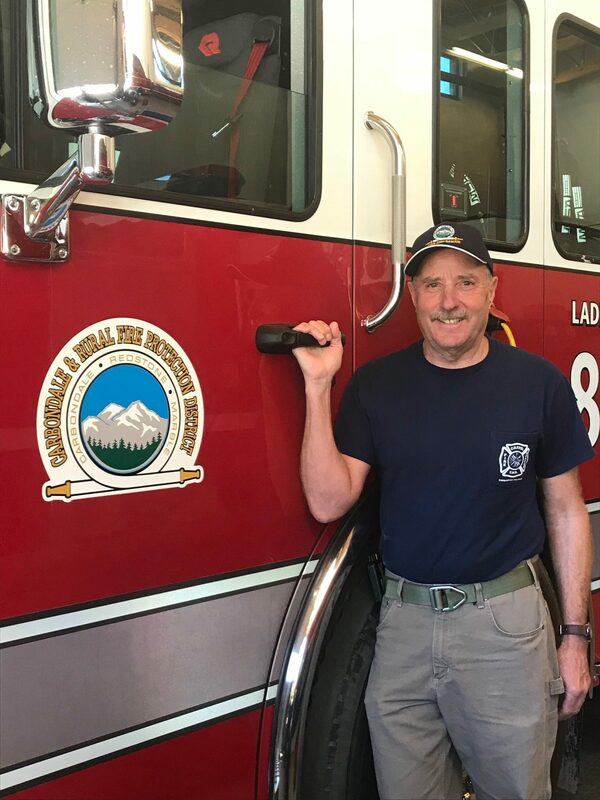 Carbondale Fire District usually sees a 40% increase in calls during the summer so the responsibility lands on Allan to make sure calls are staffed properly to handle the looming amount of work. Along with responding, scheduling and hiring, Allan has been in the process of purchasing a new ambulance for the department. He wants to focus on finding an ambulance that not only heightens the safety of the patient, but also of the EMT’s. What are your long-term goals for this position? So who is Allan Ingram? Allan is originally from Vernal, UT, but has lived in the valley for about 41 years. He has been married to his wife, Janice, for 38 years and when asked how they met, he chuckled and said; “now that is a funny story.” Allan recounts that he was skiing on Independence Pass and was trying to hitchhike his way back up to the top so he could take another run. As he was trying to flag down a ride, he saw this “beautiful girl in a green Volkswagen” bounding up the road. She pulled over and asked him what he was doing and if he needed a ride, so of course, Allan said yes. He said that she asked if he would need another ride up, and sort of became his shuttle driver that day. The rest is history and they now have two children and 3.5 grandchildren (three plus one in the oven, as Allan says). He loves to remain active and enjoys being outside. His favorite thing to do for fun is mountain biking; his favorite trail being Coal Miner’s Daughter. He likes to spend this time outside mostly by himself, but will occasionally mountain bike with a fellow firefighter. He loves music, especially Chris Tomlin and The Eagles and enjoys going to see live performances. Allan is a dedicated family man, and a strong believer as he attributes most of his success to his faith in God. After getting to know Allan better, it seems as though there could not be anyone more deserving or more fit for this position. He cares tremendously for his fire department, his fellow coworkers, and his community. He has made many sacrifices and put himself in the line of danger countless times to help total strangers and that is a characteristic not many people have. With 20 years of service at the fire department, Allan has collected a handful of stories and has seen some pretty remarkable things happen. The fire spanned 1,590 acres and was threatening many homes. Allan’s assignment was structure protection. The wildfire suddenly turned directions and came up over the hill toward Allan’s engine and the house they were protecting. Allan and his crew put on their SCBAs (airpacks), fighting through massive smoke fumes, and hot temperatures and spraying water to eventually save the house. A 911 call for a 5-year-old child, who was in cardiac arrest came in while Allan was on duty. When the ambulance got to the scene, the situation seemed grim; the child was not breathing and did not have a pulse. Allan and his crew went to work and used defibrillation and other advanced level skills to help save the child. Defibrillation is an electrical shock through the chest wall to the heart which momentarily stops the heart and the chaotic rhythm with the goal of returning to a normal heart rhythm. To everyone’s surprise, and relief, the child eventually started breathing again and has since made a full recovery. In 2005, a car had driven through the side of a house, crushing a young child underneath the wall and the car. When Allan and his crew got on scene, the child had been deprived of oxygen and was not given much hope for survival. The team was able to extract him from the wreckage and he was flown out on Flight for Life to a hospital in Denver. Allan called to check in with the nurse about the child’s condition and was told the child was on life support and had no brain activity. The child’s mom did not give up hope and would not let them take the child off life support, which ended up being the right decision as the child survived.